This can be a great substitute for oatmeal in the morning, or as a custard or pudding at night. Be creative and enjoy! Optional: ¼ t pumpkin spice, or ¼ t nutmeg, or 1/4 t cacao powder, or 1/4 t real maple syrup (not recommend on the Restart Program). Be creative to find the perfect flavor for you! Empty the can of coconut milk into a container, with an immersion blender or mixer blend the coconut milk until there are no lumps remaining. Add vanilla, cinnamon, chia seeds and sea salt (and cacao or maple syrup if desired) and mix. Pour into small cups or bowls and chill overnight (or at least 4-6 hours). Top with chopped nuts, sliced bananas, or berries. 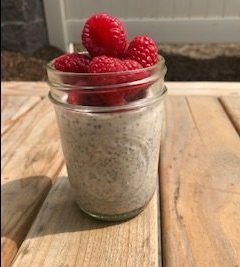 The chia seeds expand to give it a custard like texture. Contains healthy fats, fiber and is sugar free… but you’d never know it. Note: If you have not used canned Coconut milk before, it is supposed to be thick with a watery substance in it. Careful when you pour into the mixing bowl – it can get messy. All you need to do is mix it up and it is good to go. Canned coconut milk is also great in coffee or smoothies, it is low in sugar content unlike the coconut milk you find in the box.